The East Coast is preparing for a dangerous winter storm that has caused blizzard warnings to be issued from northern Virginia to southern Connecticut. It brings back memories for me of the “Storm of the Century” in mid-March of 1993 during my first year at Yale Divinity School. Of course, I dealt with plenty of snow during the seven years that my family lived in Minnesota before we moved to Texas. 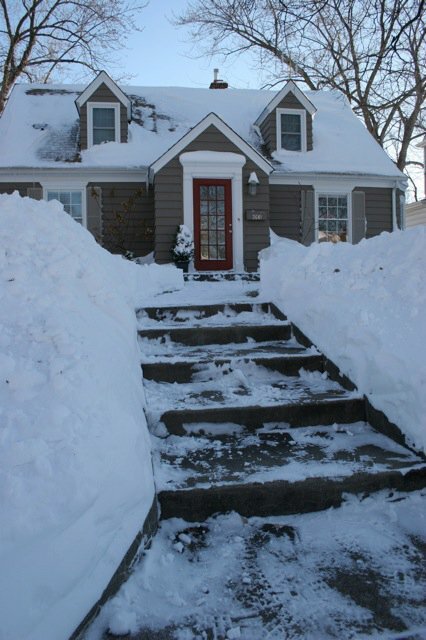 Below is a photograph of the walkway to the front door of our first house there in St. Louis Park. It was no small task to clear that path and the sidewalk and the driveway. All my love for snow. angels, forts and snow ball fights. Dairy Queen — too bad!